D. Hilton Associates Inc. Board Survey Results 2016 - D. Hilton Associates Inc.
D. Hilton’s 2016 Board Survey Results are available for download. 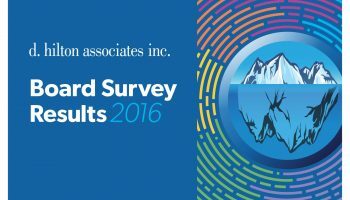 D. Hilton’s Board Survey Results 2016 seeks to better provide our industry with actionable data for the successful management and continued growth of credit unions. The report focuses on Board governance, compensation, and demographic characteristics to better understand current Board trends, how Boards are changing each year, and how credit unions can ensure strong Board leadership. To read more, please click the DOWNLOAD PDF button to the right to get a copy.